Chickenpox is usually a childhood infection. It spread easily, and is often a very mild ailment. Most of the time it is little more than a nuisance-in fact, in young children and babies it is less dangerous than the common cold. And, in most cases, a complete recovery with consequent lifelong immunity can be expected. Very occasionally in new-born babies or in a patient who has to take drugs that reduce the effectiveness of the body’s immune (infection-suppressing) system, for example, after undergoing a transplant operation. Chickenpox is caused by infection with a virus called herpes zoster. The same virus also causes shingles. Children usually catch chickenpox from an infected child, but it is also possible to catch it form an adult with shingles from exposure to chickenpox. Ti is not absolutely clear how the chickenpox virus passes from person to person. It probably spreads via tiny droplets in the air breathed out by an infected person. When a child breathes in an infected droplet, the virus starts to multiply and another case of chickenpox begins with all its typical symptoms. In the most cases of chickenpox in children, the illness is extremely mild. The incubation period (the time between infection by the virus and the first appearance of any symptoms of the illness) varies between seven and twenty three days. Chickenpox can be identified by the appearance of characteristic rash. Often in babies this rash takes the form of tiny blisters on the skin, and adults, however, tend to have more severe symptoms for two or three days before the rash appears, with temperature, shivering, aches and pains and headaches. The rash begins as minute red spots which become raised and then fill with clear fluid, like small blisters. Chickenpox spots come out in crops, which means that new ones appear over the next few days. These will eventually dry up and scabs will form over them. There are usually a few spot in the mouth, and chickenpox ulcers on the tonsils may look very like tonsillitis. Once all the spots have scabbed over and no new ones appear, the sufferer is no longer infectious. The rash generally begins on the chest and the abdomen, and may then spread to the face and limbs. There may be only two or three spots, or the rash may be profuse and cover most of the body. 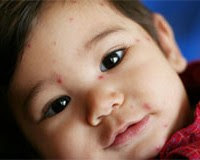 Chickenpox is recognized by the rash and general condition of the patient. It may occasionally be confused with other skin diseases such as impetigo (bacterial infection of the skin), scabies (infestation by a small burrowing mite). or pemphigusa blistering skin disease). If it is really necessary to make an exact diagnosis, then scrapings from a skin blister can be examined under an electron microscope to identify the virus.